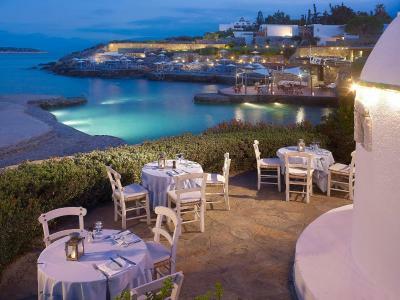 Lock in a great price for St. Nicolas Bay Resort Hotel & Villas – rated 9.1 by recent guests! Nice place to stay for a short vacation with kids and all the staff tried their best to help or provide what you need..
All the staff were wonderful and welcoming. Everything was clean and user friendly and so inviting. The breakfasts were fantastic! The owner helps everybody, everytime and is an amazing person. The staff is well trained and very friendly. The place is fantastic. We loved staying at St Nicolas Bay Resort because everything was extremely clean, well planned and the staff were not only exceptionally helpful but they were always happy and appeared to enjoy their job including the people at reception, the dinning staff and even the lovely girls who cleaned the rooms. The complimentary bottle of champagne, cakes in the fridge and chocolates each evening left on the bed was a very thoughtful gesture. Room, views, breakfast, location, spa and helpful staff. Facilities, and service were amazing. Whilst on our honeymoon they made a number of additional offerings to make us feel special. St. Nicolas Bay Resort Hotel & Villas This rating is a reflection of how the property compares to the industry standard when it comes to price, facilities and services available. It's based on a self-evaluation by the property. Use this rating to help choose your stay! 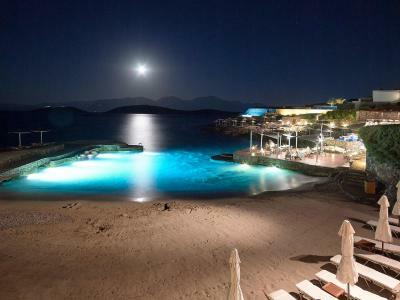 St. Nicolas Bay Resort lies on a private beachfront, 0.9 mi from Agios Nikolaos. It features 2 outdoor, not heated, swimming pools (not heated) and a luxurious spa and wellness center. 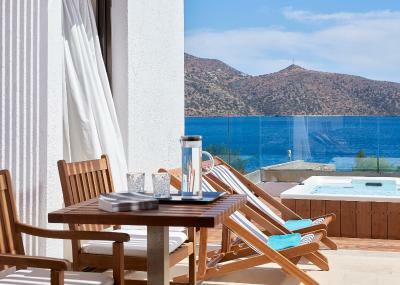 Its stylish accommodations offers spectacular views of the charming Μirabello Bay. The spacious units are fitted with terraces or balconies with unlimited sea views. 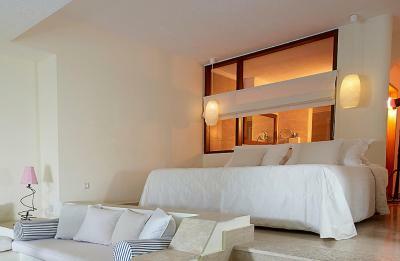 They come with free Wi-Fi, LCD satellite TV, DVD /CD player and elegant marble bathrooms. 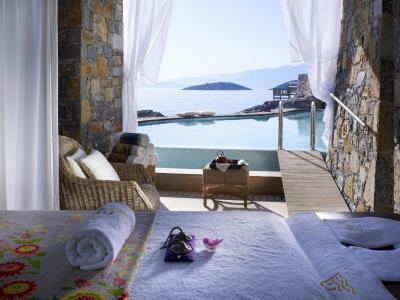 Some suites offer spa bath and private pool. 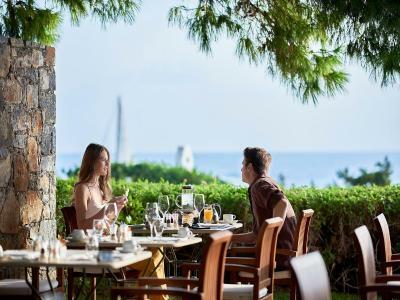 A rich breakfast including hot and cold dishes and Cretan specialties is served daily. 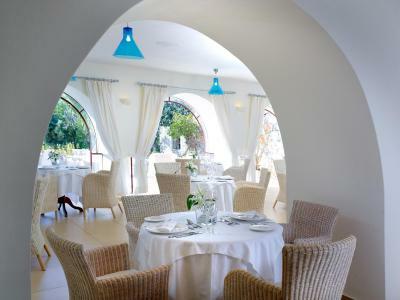 Indulge in an array of cuisines such as, Asian, Mediterranean and Cretan, at the 5 on-site restaurants. A cocktail bar, pool bar and beach bar are also featured. Relax at the spa that among others includes a thalassotherapy pool, treatment rooms, hot tub and steam bath. The facilities also feature a fully equipped gym, games room and movies showings twice a day. 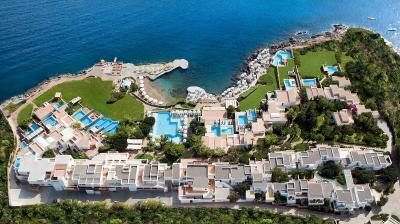 St Nicolas Bay Resort Hotel & Villas is 22 mi from the 18-hole Crete Golf Course. Heraklion Airport is 43 mi away. An airport shuttle service is available upon request at an extra charge. 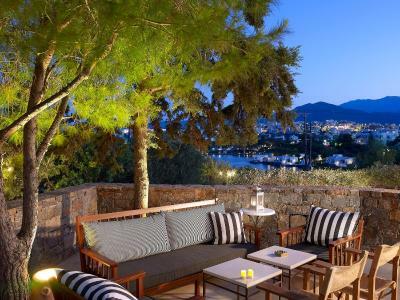 뀐 Located in the top-rated area in Agios Nikolaos, this property has an excellent location score of 9.2! 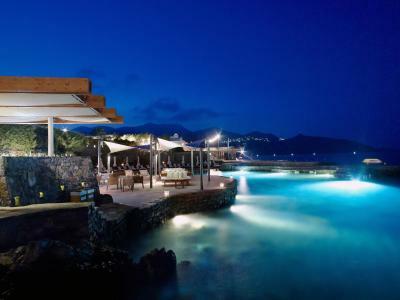 When would you like to stay at St. Nicolas Bay Resort Hotel & Villas? 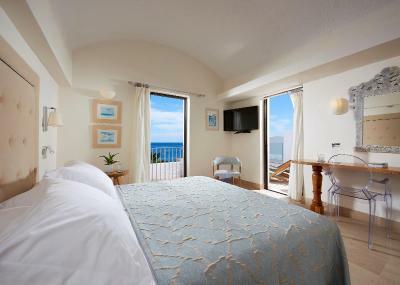 This stylish double room features a large terrace or balcony with limited sea views. It offers a DVD/CD player with a movie and music library, stocked mini-bar and beach towels. 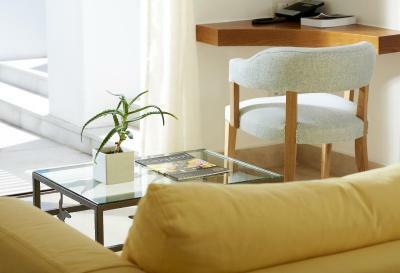 A complimentary welcome package of Cretan honey cakes, bottle of wine and a mineral water is offered upon arrival. Cleaning services are twice a day. Please note that extra beds for children are sofa beds. 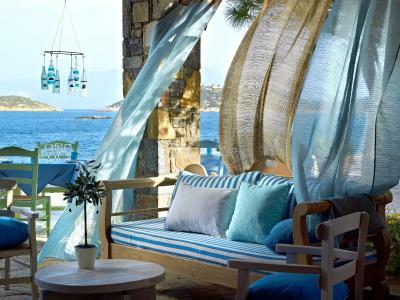 This stylish open-plan suite features a large terrace or balcony with unlimited sea views. It offers a spa bath or bath and separate shower cabin, DVD/CD player with a movie and music library, stocked mini-bar and beach towels. A laptop is available upon request. Cleaning services are twice a day. Please note that extra beds for children are sofa beds. Opening to a large terrace or balcony with unlimited sea views, this spacious suite features a separate bedroom and lounge. It offers a spa bath, separate shower cabin, DVD/CD player with a movie and music library, stocked mini-bar and beach towels. Cleaning services are twice a day. A laptop is available upon request. This stylish, open plan executive suite features a private pool around 30m2 with sea water and a fully furnished terrace that includes sun beds, parasols and sea views.It offers a spa bath, separate shower cabin, DVD/CD player with a movie and music library, stocked mini-bar and beach towels. 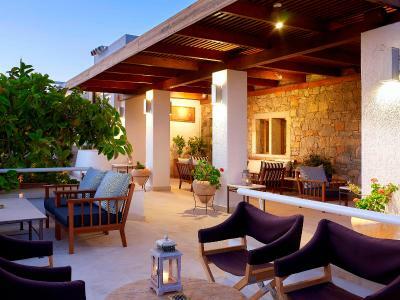 A complimentary welcome package of Cretan delicacies and a bottle of champagne is offered upon arrival. A laptop is available upon request. Cleaning services are twice a day. Please note that extra beds for children are sofa beds. This spacious and stylish executive suite features a seawater private pool around 35m2 and a fully furnished terrace that includes sun beds, parasols and sea views. It offers a separate bedroom, spa bath, separate shower cabin, DVD/CD player with a movie and music library, stocked mini-bar and beach towels. 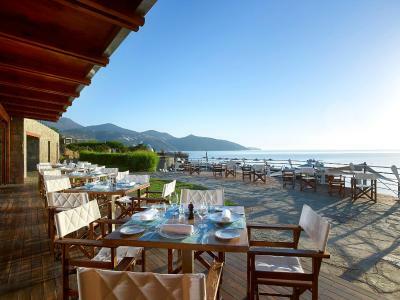 A complimentary welcome package of Cretan delicacies and a bottle of champagne are offered upon arrival. A laptop is available upon request. The concierge and guest relations team is available for any inquires during your stay. Please note that extra beds for children are sofa beds. 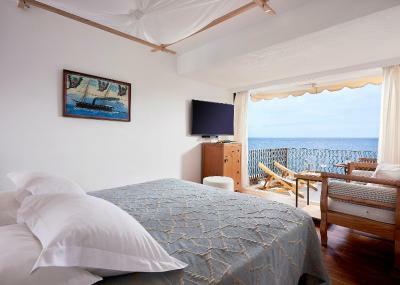 This elegant room includes a satellite, flat-screen TV and opens to a balcony or terrace with panoramic views over Mirabello Bay. 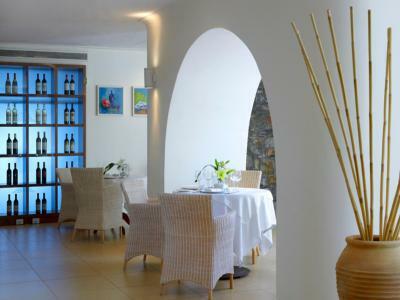 A complimentary welcome package of Cretan delicacies and a bottle of champagne are offered upon arrival. Cleaning services are twice a day. This elegant open-plan suite includes a seating area and a spacious balcony or terrace with panoramic views over Mirabello Bay. It features a marble bathroom with a spa bath and a cabin shower. 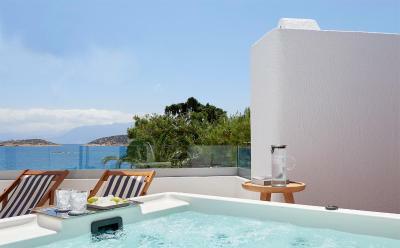 Featuring a private pool with sun loungers, this suite opens to a terrace with panoramic sea views. 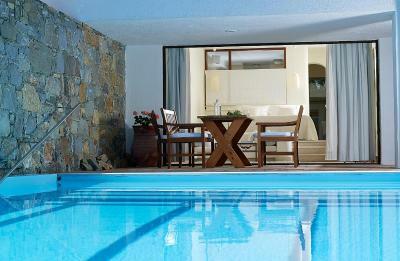 Featuring a private pool and a sun terrace with sun loungers, this suite offers a private location on the beachfront. It includes a living room on the ground floor and a master bedroom with a private bathroom on the upper floor. 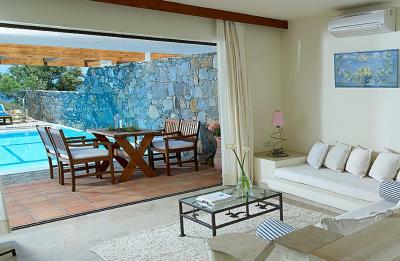 This spacious suite features an elegant lounge area that leads to the garden and the private pool. 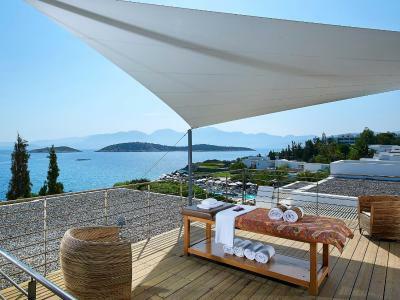 It offers panoramic sea views, bathrooms with a spa bath and a separate shower cabin. 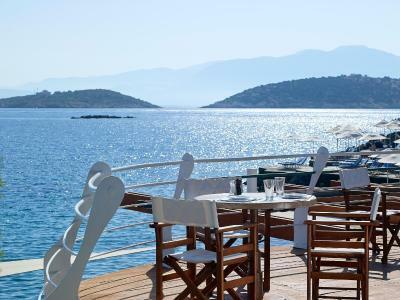 -a terrace with sun loungers and sea views. -outdoor dining table in shaded area. 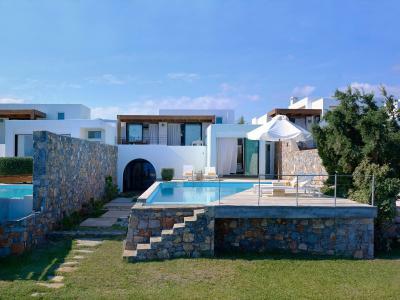 Enjoying a seafront location at the first row with absolute privacy for outdoor living, this villa has a spacious terrace with extra-sized private heated pool, sun loungers, sun shades, daybeds and panoramic views over Mirabello Bay. It has 2 spacious bedrooms, a master bedroom with private bathroom with spa bath, a separate shower cabin, and a third bedroom with private bathroom. It also has a spacious lounge with writing desk, living room and dining room opening out to a shaded private terrace with dining table and sea views. 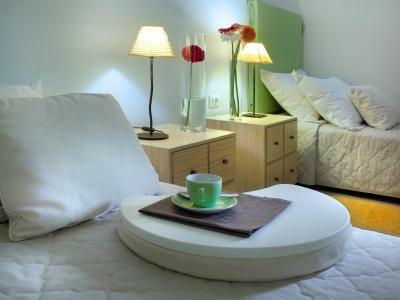 In case of accompanying staff a forth bedroom with single bed and bathroom can be provided. 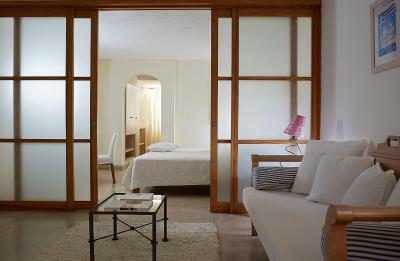 This twin/double room has a balcony, flat-screen TV and tile/marble floor. This suite features a balcony, tile/marble floor and satellite TV. This suite features a balcony, air conditioning and DVD player. This suite has a mini-bar, tile/marble floor and bathrobe. This suite has a CD player, mini-bar and tile/marble floor. This suite has a balcony, sofa and spa bath. This suite has a sofa, DVD player and mini-bar. This suite features a DVD player, mini-bar and tile/marble floor. This suite has a DVD player, tile/marble floor and CD player. This villa has a DVD player, CD player and sofa. This suite features a mini-bar, air conditioning and sofa. This suite has a tile/marble floor, CD player and DVD player.